Inspired by the work of architect Eero Saarinen, designer of the Gateway Arch in St. Louis, Arch brings a new definition of contemporary design to kitchen function. Models include both high-arching and conventional-height spouts with and without pull-out sprays. The Arch collection offers style to suit every kitchen design recipe. Also available in store by special order only see store for details. The Pekoe collection offers stylish simplicity with models to suit every kitchen design recipe. Options include high arching faucets sized for kitchen and bar sinks, pull-out, pull-down and semi-professional models. Pekoe faucets are designed to complement natural countertop surfaces with single-hole installation for a clean, contemporary kitchenscape. Also available in store by special order only see store for details. Karbon Deck-Mount Single-Handle Mid-Arc Kitchen Faucet In Polished Chrome With Black Tubing A sleek hybrid of functionality and contemporary design, the Karbon kitchen sink faucet delivers water exactly where you want it. Its black tube design features three articulating pivot points for total range of motion: extend the faucet fully to fill large pots, lower it into the sink for food preparation and cleanup, or fold it out of the way when not in use. An in-the-deck joystick valve gives you precise control of water temperature and flow. 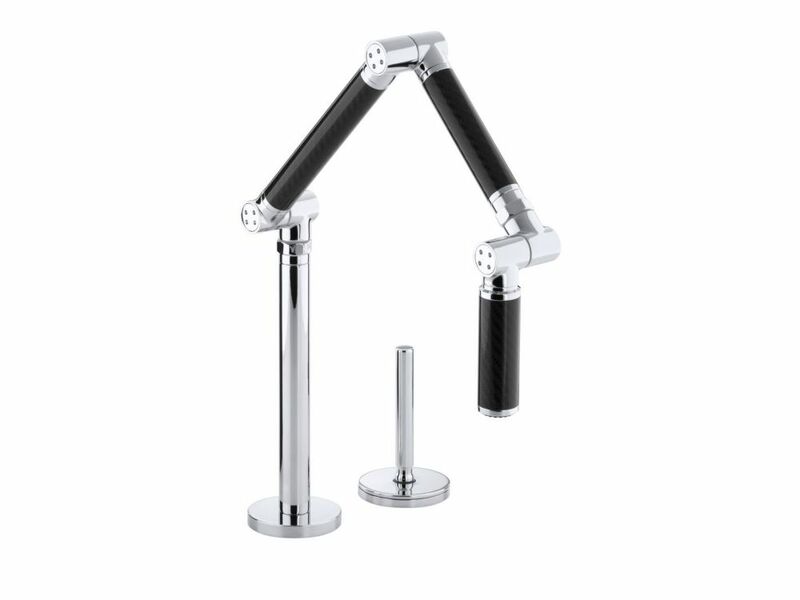 Karbon Deck-Mount Single-Handle Mid-Arc Kitchen Faucet In Polished Chrome With Black Tubing is rated 5.0 out of 5 by 1. Rated 5 out of 5 by AtlantaWaterPressure from This faucet is... ... the TRUTH and boy does it produce a large volume of water via a tight stream. Also, there have been no drips (in the year or so since it was installed) and the reach is fantastic! I do worry that with all of the joints things will loosen in the years to come but for now, everything is great. With the exception of having to sell my prized baseball autographed by "The Chicken" (Richmond Braves anyone?) to be able to afford this joker, I couldn't ask for more in a faucet.